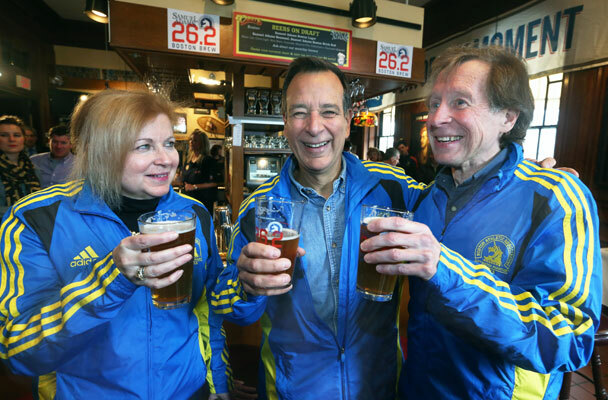 (Left to right) BAA president Joann Flaminio, Boston Beer CEO Jim Koch, and marathon winner Bill Rodgers. Boston Beer Company, maker of Samuel Adams, has filed a trademark for �Boston Strong� 26.2 Brew in the beer category. The trademark would allow for Boston Beer's annual marathon beer, "26.2 Brew", to be re-named with an eye toward supporting the victim's of this year's tragedy at the Boston Marathon. Boston Beer has long been a sponsor of the marathon, brewing the race's official beer. In light of last week's tragedy, they've pledged to donate all 2013 profits from the Boston 26.2 Brew to the Greg Hill Foundation to support the victims and their families. They have also pledged to donate 100 percent of next year's profits to marathon-related charities. If the trademark is approved, Boston Beer said it will allow others in the beverage category to use the "Boston Strong" phrase so long as 100 percent of profits are donated to charity.